I know nothing about this character, so I probably got a lot of details wrong. Like, I think his wrist cuff thingies are actually Quasar's or something. Hot-damn, Mr JH. 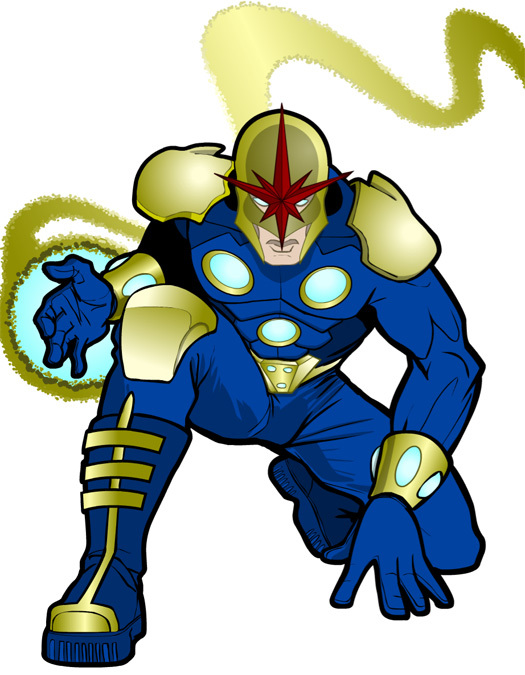 Nova should get a 4-issue miniseries just based on your design, with this pic being the cover for #1. ‘Nuff said? I think not. I like the lack of spikes. Nova’s new costume seemed a bit stupider with the spikes. Jeff, I love this. I don’t even really know this guy but I would read his comics just for great artistry like this. I would seriously include whatever elements of this costume are not in HM3 already. AWESOME Jeff! Now I have a new favorite SOD. He looks more like a MegaCity Judge. Less marketable in Spanish-speaking areas.